Latika Gupta received the Archival & Museum Fellowship, which supports creative practitioners to engage with archival & museum collections, from India Foundation for the Arts (IFA) in 2014, to curate the permanent exhibition of the Munshi Aziz Bhatt Museum of Central Asian & Kargil Trade Artifacts, Kargil. The museum is a symbol of the rich, pluralistic history of Kargil, which lay at the crossroads of trade routes from Punjab, Srinagar, Baltistan, Khotan, Yarkand and Tibet until the mid-20th century. 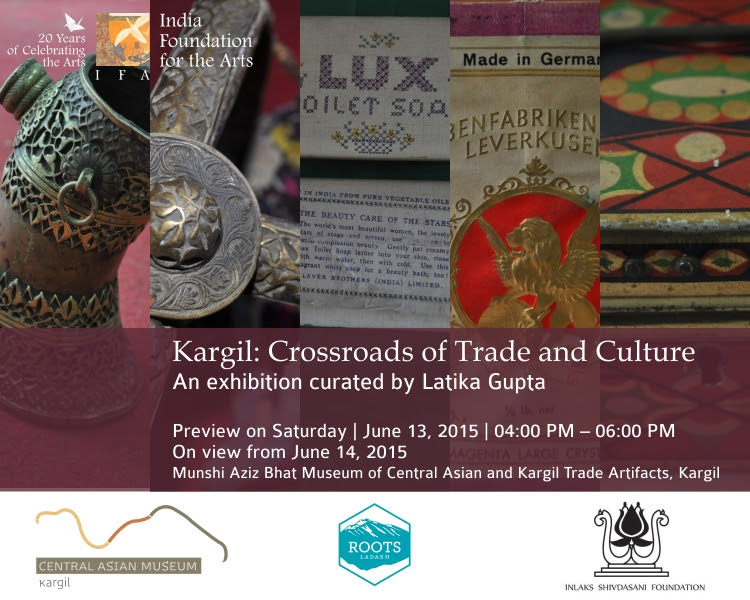 The exhibitionKargil:Crossroads of Trade and Culture highlights the once cosmopolitan history of the region through the many communities and individuals (including porters, foreign travellers, traders and common and elite local customers) associated with trade who lived and worked in Kargil. The exhibition aims to contextualise trade artefacts and objects of everyday use by underlining the relationships between things and the people who used them, in order to activate historic objects to make them relevant to contemporary audiences. The curator Latika Gupta studied at St Stephen's College and the Collage of Art and is currently pursuing a PhD in Visual Culture Studies at the Jawaharlal Nehru University, Delhi. She has received fellowships from Charles Wallace India Trust and Nehru Trust for research projects and has worked as a curator at the National Gallery of Modern Art and KHOJ International Artists' Association in Delhi, besides curating independent exhibitions. Her recent publications include articles in MARG and Postdate: Photography and Inherited History in India published by the San Jose Musuem of Art and University of California Press. This fellowship is supported by the INLAKS Shivdasani Foundation and IFA. INLAKS Shivdasani Foundation is a charitable trust committed to identifying exceptionally talented young people and providing the most appropriate assistance for the development of such talent. India Foundation for the Arts (IFA) is a national, not-for-profit, grant making organisation that supports practice, research and education in the arts in India.